For ambitious engineer Simon Darcy, winning Queen Victoria’s competition to recover lost inventions of historical significance is a matter of pride—and redemption. After all, it was Simon’s failed monorail project that left his family destitute, and winning the tournament would surely restore the Darcys’ reputation. Simon sets his sights high, targeting no less than the infamous time-travel device that forever changed the world by transporting scientists, engineers, and artists from the twentieth century. The Mod technology was banned and supposedly destroyed, but Simon is sure he can re-create it. 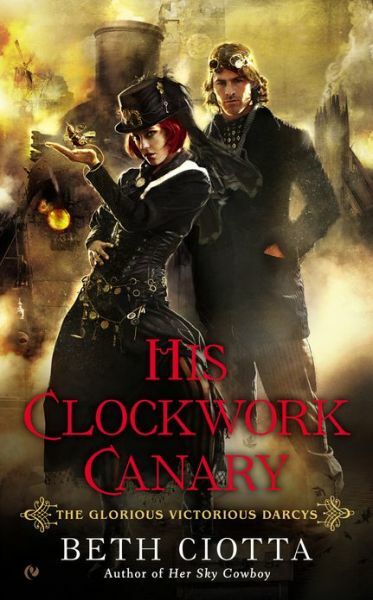 His daring plan draws the attention of Willie G., the Clockwork Canary, London’s sensationalist reporter. Simon soon discovers that Willie is a male guise for Wilhemina Goodenough, the love of his youth, who left him jilted and bitter. He questions her motives even as he falls prey to her unique charm. As the attraction between the two reignites, Simon realizes that this vixen from his past has secrets that could be the key to his future…as long as he can put their history behind him. Wilhelmina Goodenough, known socially as Willie G. and professionally as the Clockwork Canary, refrained from thunking her forehead to her desk due to the booming voice of her managing editor. She did, however, roll her eyes. She could always tell by the timbre of Artemis Dawson’s bellow whether she was being summoned for a goodreason or bad. This was bad. Given her foul mood of late, this could mean a bloody ugly row. As lead journalist for the London Informer, Britain’s most popular tabloid, Willie had earned a desk in close proximity to Dawson’s office. Lucky her— or rather him— as was public perception. For the last ten years, Willie had been masquerading as a young man. Sometimes she was amazed that she’d gotten away with the ruse for so long. Then again she was slight of frame as opposed to voluptuous. What womanly curves she did possess were easily concealed beneath binding and baggy clothing. Her typical attire consisted of loose linen shirts with flouncy sleeves, a waistcoat one size too big, and an American-cowboy-style duster as opposed to a tailored frock coat. Striped baggy trousers and sturdy boots completed the boyish ensemble. A vast selection of colorful long scarves had become her trademark, as she always wore one wrapped around her neck in a quirky style no matter the season. When outdoors, instead of a bowler or top hat, Willie pulled on a newsboy cap and tugged the brim low to shade her face. She’d chopped her hair long ago, a shaggy style that hung to her chin and often fell over her eyes. She was by no means fashionable, but she did have a style all her own. And not a bustle, corset, or bonnet to her amended name. Once in a great while she yearned for some kind of feminine frippery, but she was far more keen on surviving this intolerant world than feeling pretty. Blast. “Best get this over with,” she said to herself, because no coworkers were within earshot of her somewhat sequestered and privileged work space, and even if they were, she wasn’t chummy with any of the blokes. Willie had two confidants in this world: her father and her journal. One hidden away and one locked away— respectively. Out of habit, Willie checked the time on her pocket watch, then consulted the timepiece on her multifunctional brass cuff. Her preoccupation with time had prompted the “Clockwork” portion of her professional name, and was often a source of unkind jest for fellow journalists. Their assessment of her peculiar habit meant nothing to her, whilst knowing the precise time and how much time had passed between certain events was of vital importance. Abandoning her research on significant technological inventions, Willie pushed away from her scarred wooden desk. Her home away from home, the desktop was crowded with stacks of books, piles of documents and files, scores of pens and pencils, her typewriter, her personal cup and teapot, and a working miniature replica of Big Ben, otherwise known as Clock Tower. Dawson often wondered how she found anything, but she did in fact know the precise whereabouts of any given item. Organized chaos: just one of her many gifts. On the short walk to her boss’s office, Willie breathed deeply, seeking solace in the familiar scents of the news-room— ink, paper, oil, cigarette smoke, sweat, and assorted hair tonics. Scents she associated with freedom and security. This job enabled her to pursue her passion as well as provide for herself and her addle-minded father. Forsaking her gender and race had seemed a small price to pay in the beginning. But lately she teemed with resentment. Bothersome, that. She had no patience for self-pity. “Yes, I know, Willie. The father who blew himself up whilst building a blasted rocket ship! Two Darcys suffer ruin due to two fantastical projects one day apart. One week before a global race is announced that promises to stir up interest in outlawed inventions, if you know what I mean—and I know that you do! “The timing, dear boy, is perfect! Pick Simon Darcy’s brain whilst he’s vulnerable. Get the scoop on his failed project and his father’s bungled invention. Probe deeper and dig up buried family secrets. Go where no man has gone before and ferret out never-disclosed-before details regarding Briscoe Darcy and his time machine. If anyone can do it, you can!” He pounded his meaty fist to his desk to emphasize his point. Willie felt the force of that blow to her toes. Her temples throbbed and her pulse stuttered. Aye, she could do it. But she did not want to. The subject of their discussion was too close to her well-guarded heart. Though she said nothing, Dawson clearly read her reluctance due to her obviously not-so-guarded expression. Gads. This was worse than bad. Willie did as the man asked, then slumped into a chair and settled in for a lecture. She resisted a glance at her cuff watch. As long as she didn’t make physical contact with Dawson, time was irrelevant. Meanwhile her keen mind scrambled for a way to get out of this pickle. Although Dawson could be a curmudgeon, he’d always had at least a sliver of good humor hiding beneath the guff.